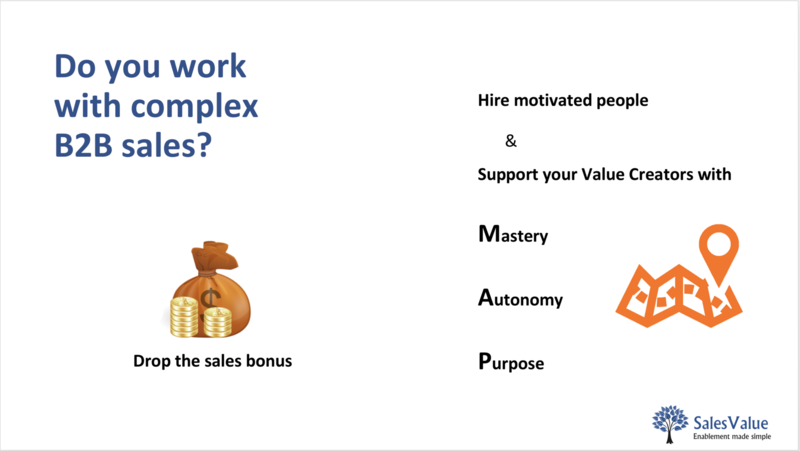 In short there is a lot of areas where you can help create focus on purpose, mastery and autonomy, which will help create a motivate sales team. You can drive this focus through your dialog and communication with your sales team, and you can also ensure that it is embedded in your sales enablement. A big driver of motivation is if your employees can see a higher purpose of what they do. This is typically a combination of your companies overall purpose as well as the purpose of helping their customers. I call employees that are motivated by helping their customers, Value Creators. I recommend that you have an inspiring purpose for your company, and that you make sure that everybody knows the purpose. At SalesValue our purpose is to create value. I believe that if we can help our customers create value for their customers we have the right focus. I can also recommend that you read the book Start With Why by Simon Sinek, and you can also include links to his TED talks in you Sales Enablement solution. Another big driver of motivation is mastery in a given area. E.g. a triathlete that is focused on becoming the best in the world will focus on mastering both swimming, biking and running. Focus on becoming better and mastering a task is highly motivating. In relation to sales, there is many areas you can help your sales team master. Below is a few examples that I have found useful. A good sales person that can help your customers knows your products and solution and how they translate into business value for the customers. Encourage your sales team to know your products. Provide the sales team with good product training on many levels from technical to business focus, as well as in many formats from class room training to relevant presentations, white papers and brochures. To be able to help the customers it is often valuable to understand the customers industry. To have an industry expert on the sales team can be a very valuable help that the customers appreciate. Consider letting some of your sales team be experts in specific industries and sharing there experience with others. B2B sales is constantly evolving, as illustrated by studies like CEB/Gartners research Challenger Sale and Challenger Customer. Mastering the sales method and sales psychology is a constantly evolving task. Encourage your sales team to constantly improve, and recognize the efforts and progress they make. In B2B sales it is often important to present your solutions, the implementation plan, the company, etc. Likewise it is increasingly important to facilitate dialog within the customer to create consensus. Presentation and facilitation is also a task you can really learn to master. We all know somebody that is just way better than others. Allow the employees that want to master this area to do so, and acknowledge them for their achievements. Your customers will always have to justify the purchase one way or the other. A common way is by using business cases and ROI calculations. This is also an art of it's own. Provide training and help for the people that wants to master this area. Mastery requires focus, so be aware not to expect all your sales people to master all areas. Let them focus and become masters, and acknowledge them for both their efforts and results. A Sales Enablement solution is a great place to gather the above training material and content. Additionally you can also use the solution to highlight who is specialists in given areas, e.g. product specialist or subject matter experts in relation to sales psychology. This can help strengthen the employees focus on mastering the areas they are responsible for. Another big driver of motivation is autonomy over tasks, technology, time and team. Managing your team and controlling their tasks is important. You want your sales person to perform specific sales tasks, and you might have rules for target customers, market segments, etc. But there is still many areas where you can give your sales team autonomy over their tasks, e.g. which customers to priorities and which tasks to do first. Tell your employees where they have freedom to choose and prioritize their own tasks. You most likely also have rules for which solutions to use like CRM system, Sales Enablement solution, Email system etc. But there is still room for the autonomy. You can let your individual sales person decide how she mixes the use of phone, email, social platforms and physical meetings. A central idea behind SalesValue is that sales employees in B2B sales use their drive for autonomy, to create their own presentations, proposals, etc. and customize them to the customers specific needs. This is great for motivation, but traditionally it has been bad for knowledge sharing and continuous improvements. With SalesValue you can allow the autonomy, but still get the continuous improvements, by automating the knowledge sharing and inspiration. Leave a comment below or write to me at thomas@salesvalue.net or twitter thomasthejn.